“Kobe” beef is a protected name. It can only be used for beef from the Wagyu Tashima-ushi breed, a black cattle from Kobe in the Hyogo prefecture. The animal must be born, raised and slaughtered in Kobe. Otherwise it can not be called and sold as such. That means not every Wagyu beef is a Japanese Kobe beef. Cross breeds with Wagyu cattle and other cattle such as Angus in the USA or Hereford in Australia are common but can not be offered as Kobe beef. Even in Matsusaka is Wagyu beef not sold as Kobe, but as Matsusaka beef, which is actually claiming to be even better than Kobe. A thing like “Kobe beef from Australia” or anywhere else does not have anything in common with the original Kobe. 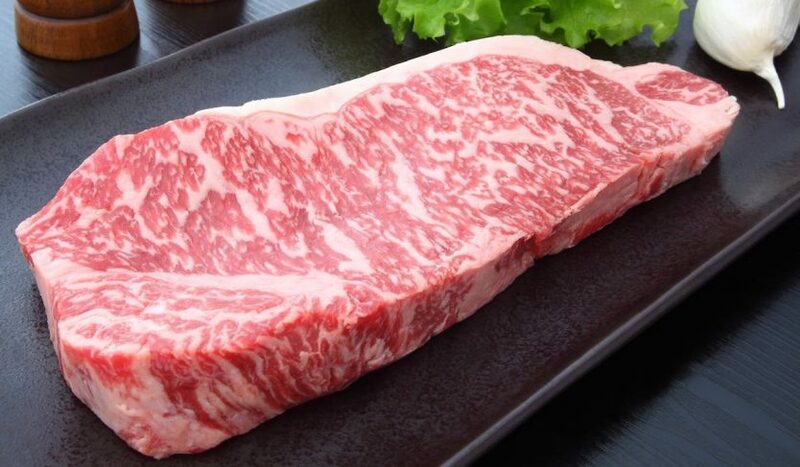 A great difference between Kobe beef and other Wagyu breeds beef are the fat and the distribution of the fat. The presence of significant ratios of oleaginous fat versus saturated fat and the high percentage of both Omega 3 fatty acids and Omega 6 fatty acids, combined with an evenness in marbling unmatched in any other cattle, yields a meat that is not only significantly more tender and flavorful but also much lower in cholesterol and saturated fat than the meat of other breeds of cattle. The fats in Wagyu also have a significantly lower melting point, 7 degrees Celsius; which means the fat literally melts in the mouth. The strange and unique thing is that the Wagyu breed does not display any horns….. The marbling ( fat streams between the muscle meat ) is responsible for the tenderness and flavor of the meat. The marbling grade is given after the cattle was slaughtered and the rib eye cut. According to the rib eye marbling, the whole cattle is then given the marbling score. That is actually a bit unfair, as if for example 5 rib eyes from 5 different cattle are all given the score 9, that does not guarantee that all 5 tenderloins or rump steaks of those cattle are same tender. They might be less or more tender. Which means, if you really are relying on marbling grades, you could only order a rib eye steak…. At Casa Pascal, we take great pride in selecting choice beef from all kinds of sources, including sometimes authentic Kobe beef and even Hanwoo beef from Korea. Take a look at our specials to see what’s currently on offer. ...et soyez le premier à recevoir des nouvelles sur nos promotions.